It is out of dire need that fashion consumerism needs to be rethought for sustainability of our Planet. The fashion industry is currently the second-highest global polluting industry after oil. With over 80 billion new garments produced every year, textile waste and cheap industrial fast-fashion supply chains are great causes of concern. We can all be doing a greater part to consciously purchase and product less wastage. This series aims to highlight labels that are focussing on ethical production, sustainable and eco materials as well as reduced damage to the environment. May we support labels consciously made from a labour of love, focussing on the vision of high quality and not quantity, so that we may cherish thoughtfully bought items for longer. One of my personal favourite labels is Indian-based Grassroot by Anita Dongre. 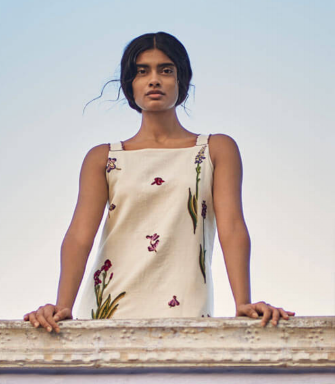 A sustainable luxury brand born to revive, sustain and empower India's crafts and artisans. Her design ethos translates village art into design for the globetrotting woman, and works with villages to showcase the handcrafted traditions of India in contemporary tales. In The Sustainable Series Tags Clothing, Fashion, Sustainble, Organic, Who Made Your Clothes?